Three times Richeldis experienced this vision and request. This confirmed her desire to have the replica constructed, but the directions about the exact location were unclear to her and the carpenters. Richeldis gave instructions for the building to commence but nothing seemed to go right. When the carpenters could make no progress in building, Richeldis found it difficult to go to sleep. She spent the night in prayer, asking for guidance. There was an energy in the air that “made the night seem almost alive.” She heard singing that seemed “not of this world” and went out into her garden to investigate. She noted that the “heavenly singing” was coming from the direction of the unfinished construction. As she approached the site she was amazed to see that the little house had been completed – but had been moved about two hundred yards from the site of the original construction! She then saw what appeared to be angels leaving the now completed house. When the carpenters returned to the site, they, too, reported hearing strange sounds and were amazed to see that the house had been moved and completed. They pronounced the craftsmanship of the completed construction to be far superior to their own. The Holy House had been miraculously built, and very soon pilgrims began to arrive. During the Middle Ages, Walsingham became one of the greatest pilgrimage sites in all of Europe. It became widely known as “England’s Nazareth.” A church was constructed around the house to protect it from the elements. All walks of life came there – peasant, king, rich and poor. At the Holy House, all were equal. From the time of Henry III in 1226 almost every king and queen of England as well as Queen Isabella of France and King Robert Bruce of Scotland visited the shrine. For almost 500 years, Walsingham continued to draw thousands. Many miracles were attributed to Our Lady of Walsingham, including one in which King Edward I was saved from a piece of falling masonry. In the early 1500’s, Henry VIII visited the Holy House of Walsingham more than once as a pilgrim. On one such occasion he walked barefoot twice the usual distance traversed by penitents. But Henry’s ways changed as the years passed. In an effort to be rid of one of his wives, Queen Catherine, and marry another, the king broke with the Pope and had himself declared by his parliament to be head of the English Church. Then, in 1538, in order to move against all religious orders in his domain, Henry confiscated and burned to the ground the Holy House of Our Lady of Walsingham. Only a portion of the massive east wall is visible today. A wealthy Anglican woman, Charlotte Boyd, bought and restored it in 1863. 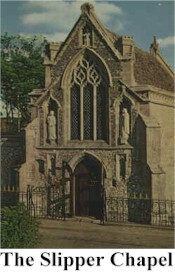 In 1864, Pope Leo XIII re-founded the ancient shrine of Our Lady of Walsingham, and pilgrimages were permitted to resume. 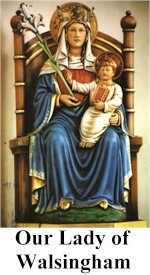 In 1954, the image of Our Lady of Walsingham was solemnly crowned at the direction of Pope Pius XII. A chapel devoted to Saint Catherine of Alexandria, about a mile before the shrine, became nicknamed the “Slipper Chapel” because visitors would leave their footwear there, out of respect, and walk the last mile barefoot or in slippers. Our Lady of Walsingham is also known as “The Virgin by the Sea.” The medieval ballad told that she helps mariners in distress. The Anglican pilgrim hostel displays the name “Stella Maris” or “Star of the Sea,” one of Mary’s more ancient titles. Just a few miles from the Norfolk coast, Walsingham is a sanctuary of prayer and healing, a metaphor of salvation from storm and shipwreck, offering calm waters and safe harbor for all in trouble.